We all need quick easy recipes for weekdays meal. Specially in hot and humid country like ours, spending long hours preparing and elaborate cooking is really stressful. Here is one such easy recipe that can be a instant hit. I had some bhetki or betki fish in the freezer and was not sure what to prepare with that. I was not very kin to make the usually Bengali fish curry with that. 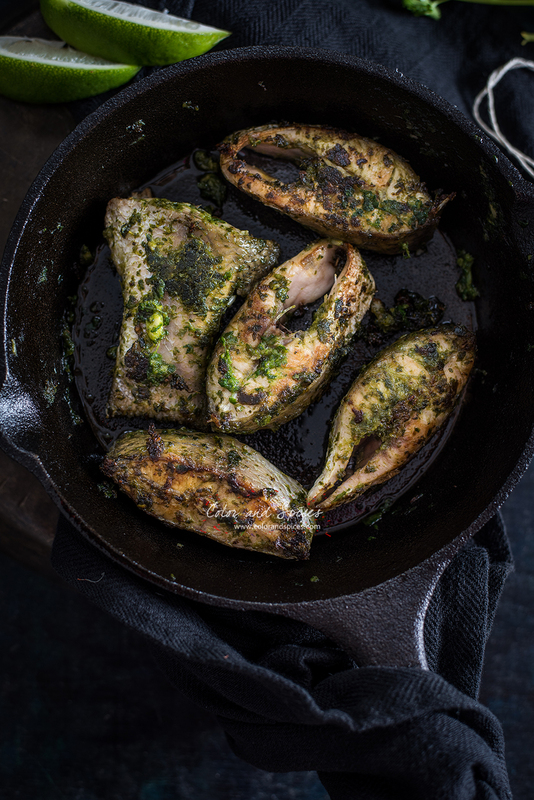 So combined the delicious fish with a quick coriander pesto. Add garlic and a good dose of green chilies, you can always reduce the amount of chili as per your taste. 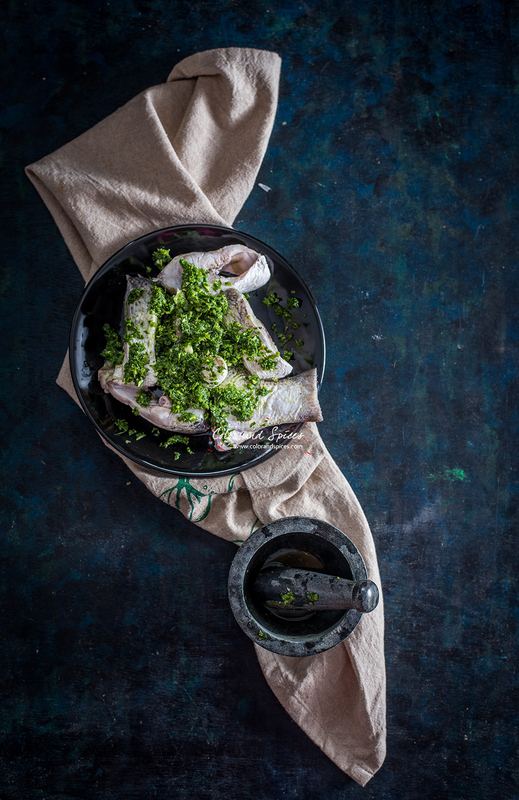 Ingredients are very simple, fish, fresh coriander, ginger, garlic, green chilies and lime juice. The only time it takes is while the fish is marinating in the paste, or else it can be done in else than 15 mins. 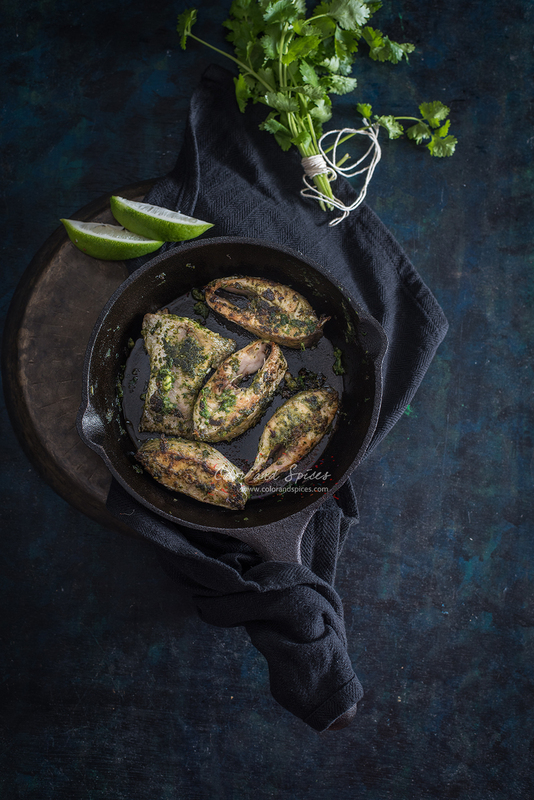 I used bhetki, but any other fish or shrimps can be used, and fish fillets can also be used to prepare this dish. Even paneer or tofu can be a good choice for vegetarian and vegan people. 1. Wash and clean the fish (you can use paneer or tofu). Rub salt and lime juice on the fish pieces and keep aside. 2. Make a paste of coriander, garlic, ginger, green chili, salt. Do not make it very smooth, I used a morter pastle to get that rough pesto consistency. 4. Heat a heavy bottom pan, add olive oil. When the oil is hot cook the fish for 5 mins each side, along with the green paste. Serve hot with lime wedges.